This is our update on the satellites currently orbiting the Earth at the start of 2019. According to the Index of Objects Launched into Outer Space, maintained by the United Nations Office for Outer Space Affairs (UNOOSA), there were 4 987 satellites orbiting the planet at the start of the year; an increase of 2.68% compared to end of April 2018. UNOOSA recorded 382 objects launched into space during 2018, which is 15.67% lower than the 453 objects launched in 2017 that was the record year for objects launched into space. Part of this reduction is down to the fact that Planet, who have been regular cubesat launchers over the last few years have achieved their initial goal of imaging the Earth’s landmasses every day, and so they are currently focussed on maintaining, rather than expanding their constellations. According to UNOOSA, in history a total of 8 378 objects have been launched into space. Currently, 4 994 are still in orbit – although 7 of them are in orbit around celestial bodies other than the Earth; meaning there are 4 987 satellites whizzing around above our heads every single day. The table below shows the number of objects launched into space in every year since the first launch in 1957. For the first eight years there is steady growth and then from 1965 to the start of 1990 generally around one hundred fifty (± twenty) objects being launched each year. The next twenty years were a bit up and down with a low of 72 in 2005, however the cubesat driven growth can be seen starting in 2013. The next ten years will interesting, it is unlikely that the same level of recent growth will be maintained, but equally there will still be a significant number of satellites being launched each year. The UK Government last summer forecast that there will 2 000 small satellites launches by 2030. Where have all these objects in space been launched from? Baikonur Cosmodrome in Kazakhstan with 1 734 launches. Cape Canaveral in the United States with 1 203 launches. Vandenberg Air Force Base in the United States with 1 103 launches. Centre Spatial Guyanais in French Guiana with 510 launches. How many of these orbiting satellites are working? The Union of Concerned Scientists (UCS) keeps a record of the operational satellites and their latest update provides details to the end of November 2018. Using this database together with the UNOOSA Index shows that there are currently 1 957 active satellites in orbit, which represents just under 40% of the satellites orbiting the planet. Interestingly, this is also 1.16% lower than the last update of this database for April 2018. In effect, this means that we there are 3 030 limps of metal flying around the Earth at thousands of miles per hour doing absolutely nothing. What are all these satellites doing? Although, it should be noted that some of the satellites have multiple purposes. Who uses the satellites directly? It should be noted that 279 satellites (14.25%) are listed as having multiple uses. When you next look up at the night sky …. 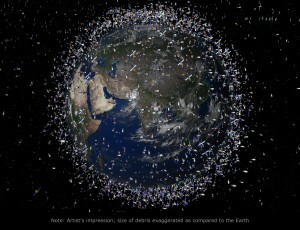 Remember that alongside all of the amazing stars are thousands of active, and inactive, satellites orbiting the planet. This entry was posted in Data, Earth Observation, Satellite, Space Can Help, Space Industry, UK Space Industry, Understanding Space and tagged 2019, Earth, Earth Observation, how many satellite in space, how many satellites, how many satellites are in orbit, how many satellites are in space, How many satellites are orbiting the earth, how many satellites are there, how many satellites in orbit, how many satellites in space, how many satellites orbit earth how many satellites does earth have, purpose of satellites, satellite launch sites, satellite launches in history, satellite uses, satellites around earth, Space, Space debris, Union of Concerned Scientists, United Nations Office for Outer Space Affairs, UNOOSA, who uses satellites by Andy. Bookmark the permalink. How many of these satellites are being used for 5G ? I’m not sure exactly how many of the satellites in space are being used for 5G, other than it is currently a relatively low number. The reports of around 20,000 of 5G satellites being launched haven’t really started – although the UK firm OneWeb is due to send it’s first 10 up later this month, and SpaceX is due to start it’s programme later this year. Sorry we can’t give you any more precise detail. I love this connection! I hadn’t picked it up – you’re right there is a lovely symbolism of having 1 957 active satellites in the blog and the launch year of Sputnik. Unfortunately, that link will have been broken long before the SpaceX launch. The number of active satellites in space is a very fluid number as new satellites are launched regularly and other satellites are deorbited – for example, there have already been twenty to thirty satellites launched in 2019 before the SpaceX one. So sadly, the symbolism would have disappeared very quickly, our blogs only report at a point in time. Thanks for your interest and comment on the blog. Is there any other database than UCS where I can find more data of Satellites on worldwide level altogether in CSV format? I’m not aware of another complete list of all satellites which you can export, however it might depend on what you are looking for. For example, the Observing Systems Capability Analysis and Review Tool (OSCAR) website – https://www.wmo-sat.info/oscar/satellites – has a list of all Earth Observation and meteorology satellites that is exportable. There are some excellent other databases of satellites, such as Gunter’s Space Page https://space.skyrocket.de/doc_chr/lau2019.htm, but this isn’t downloadable. Sorry, we don’t know of any others offer what you are looking for. How many satellites work in the Ku band? Unfortunately, we don’t have any exact figures on the number of satellites in the Ku Band. It’s not something that tends to be listed on the databases. There are a couple of websites which have listings of satellites with the Ku band, but I don’t know how accurate, complete or timely they are. https://www.isatdb.com/en/Satellite-List and https://www.lyngsat.com/launches/ku.html both have lists which may be helpful. Sorry, we can’t give you a better answer. Thanks for your wonderful and highly useful blog. I was wondering is it possible to know how many (if any) confirmed cases of satellites accidentally crashing into each other have there ever been? i.e. How likely/unlkikely, or how frequent, is it for such accidents to occur? Thanks for your comments and we’re glad to hear that the blog is useful. We’re only aware of one confirmed satellites colliding which was on 10th February 10 2009, when the Iridium 33 and Kosmos-2251 satellites collided. Both the USA and China have destroyed satellites by firing at them, but these were deliberate acts rather than accidentially. There are plenty of examples of satellites, including the International Space Station, been moved about in orbit to prevent collisions. The bigger challenge is the space debris issue as even tiny pieces of debris travelling at high speed can cause damage. We’re aware of a number of satellites being hit and damaged by debris, including Sentinel-1A, but none have been destroyed so far. In theory, yes assuming you have the money and follow all the legal and regulatory requirements. Internationally, the 1967 United Nations Outer Space Treaty governs the launch of objects into space and most countries have their own systems for managing this. In the UK it’s the Outer Space Act 1986, which outlines the steps you need to take to launch a satellite. We wrote a blog on it which you can see here. The other issue is the cost of building and launching a satellite. Although, these costs are coming down with cubesats and nanosats meaning a lot more organisations are launching satellites. Where have you done your research? The data comes off the United Nations Office for Outer Space Affairs – Register of Objects Launched Into Space and the Union of Concerned Scientists Satellite database, and then we do our own analysis. I’m interested in what satellites do. What types of information can they gather? Can a satellite pinpoint a person? The information satellites collect varies depending on what their purpose is, and what instruments they carry. So Earth Observation satellites are all collecting information about the Earth – but they could be collecting information about the sea, the land, the weather or the air. The instruments also make a difference to the data collected, so some satellites collect optical data and others collect radar data : this post explains the difference between the two. A satellite can’t really pinpoint a person, as a person would only represent a couple of pixels on an image. Landsat 8 didn’t stop in 2017, it is still acquiring images today. There are a lot available on the EarthExplorer and GloVIS websites. and do you know free satellite provider i can use it as an API for low level tier? such as NASA ,that provide update regularly? Thanks for the question. The main free data providers we use are NASA and the ESA/Copernicus product. There are others around the world, but it does depend on what data you want and what you are trying to do with it. For NASA a good starting point for API’s is https://api.nasa.gov/; similar for ESA/Copernicus there a good starting point would be https://scihub.copernicus.eu/ which has details of its API Hub.